Archaeologists from The Roman Gask Project, based at Liverpool University, have been in Angus learning more about the Roman occupation of the area 2,000 years ago. For the past fortnight, the volunteers have been spending time uncovering the secrets of the most northerly fort in the Roman Empire at Stracathro, with some startling and unexpected results. 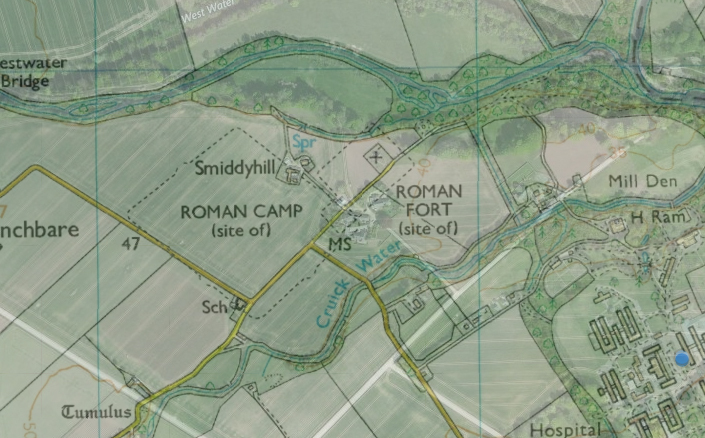 The survey, led by Directors Dr David Woolliscroft and Dr Birgitta Hoffmann, originally aimed to uncover evidence of the first century fort and the adjacent Roman marching camp. The fort is believed to comprise part of the Roman Gask frontier, a series of forts and watchtowers stretching from Doune in Stirlingshire and ending at Stracathro in Angus. Scotland was purely a military zone for the Romans; they came and expected to settle, like they did elsewhere in Britain, but politics intervened and they never did fully conquer the north. We’ve made lots of interesting discoveries, many of which have confirmed our suspicions. Not only did we uncover evidence of interior buildings within the fort, we have a good idea as to how soldiers in the north of Scotland lived, such as the indication for everyday structures such as now have indications of how the soldiers up here lived, with evidence for barracks, the Roman equivelent of a pub, and possibly even evidence for a bathhouse. Through the geophysical survey, we’ve also been able to see one of the camp gates, which are renowned in the archaeological world for giving their name to a peculiar style of entrance to marching camps rarely found outside Scotland. Stracathro gates have a rounded projection on one side of the gate so the enemy would have exposed their sword carrying hands to the Roman soldiers on the gates, making them more vulnerable in an attack. Before we started this survey, we had limited information about Stracathro, primarily gathered from aerial photography, but by undertaking a large scale geophysical survey we’ve been able to learn about whats beneath the soil without the need to excavate. Although much can be learned through excavation, it’s a destructive technique as you’re digging through the remains of the timber buildings and once it’s gone, it’s gone! We’ve added to what we know about the Romans in this part of Scotland. Much more than that, we’ve been amazed at the amount of local support which we’ve had for the survey. Lots of people have come to the site to look round, volunteer and find out more about their local history. The work at Stracathro forms part of the larger Roman Gask Project, an ongoing research survey which is based at the School of Archaeology, Classics & Egyptology at Liverpool University. The Project itself is an exploration of what is believed to be the earliest land frontier of the Roman Empire. The Directors of the Project hope to publish their findings next year.